There are many different kite designs in the world of kites today. Most of these differ in color, design as well as shape and size. We are going to take a look at some of the more common designs such as basic diamond kites to animal, 3D, box and sled kites to name a few. Two reasons why kites differ in design are aerodynamics and appearance. The fact is a kite must fly therefore it must have aerodynamic properties which are lift and drag. Also if every kite was the same shape, that would be boring. So over the centuries people have been able to design different types of kites. 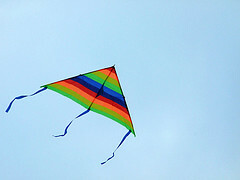 You will see a huge range of fun kites to fly. From beginner kites to advanced, single line to dual and quad line, Diamond kites to Power kites and more. Take a sneak peak now at some of the amazing kite creations that people are making now. 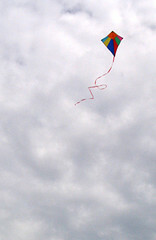 Click here to view our kite pictures. They really are amazing! Come and see these amazing box kites by clicking here. Sled Kites produce good lift. Possibly the most basic of kite designs is the Diamond kite. These are so easy to make and design and also very cheap to buy. The diamond kite is made up of two sticks or dowel which are crossed over and secured. Then a bright colored sail (plastic, nylon or silk) is attached. The kite is completed with a decorative tail and then add your kite string. Your kite is ready for flying. The Delta Kite is one of the most fun kites to fly. It comes just about ready to fly. All that you need to do is read and follow the instructions provided, then place the spreader bar in between each leading edge and then take-off. There are two types of Delta kite - single and dual line. I have flown a dual line Delta kite before and therefore prefer these over the single line. With a dual line kite you are better able to turn and perform stunts such as loops, figure 8's and more. The Box kite has been around since The Wright Brothers. It is believed that they used the box kite to invent the first flying machine. The box kite which comes in so many different forms is a very good lifting kite and can fly at excellent altitudes. Different models of these 3d kites are the Winged, Delta, Pely, Comyne, Delta Conyne, Cody, Waldof, Snowflake, Tumbling Star, Pyramid, Wayfarer and the Hot Sojourn just to name a few. One thing you may not know about Box Kites is that they hold the altitude records for kite flying. Goes to show the amount of lift these excellent kites give. 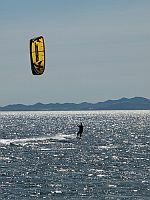 If you are looking for a real adrenalin rush then you want a Power Foil kite or Traction kite. These kites are for the experienced flier only. For those wanting to start learning the awesome power of a power kite can begin with a trainer kite. With the right winds and conditions power kites will easily lift a person off the ground or water. They are used for recreational, kitesurfing, land buggying, snowkiting, skating and training. There are many, many unusual designs out there. Some are very clever and colorful. Some fly better than others. Some are just really weird. No matter what your kite preference the fact is that kite flying is still as much fun today as it was decades or even centuries ago. Return from Kite Designs to Types of Kites.